Many legends and historically documented events surrounding the life of St. John Bosco give evidence to the fact that the bond of love that existed between him and the boys he mentored was a profound, Christian-based love that was able to both heal and transform the at-risk youths he encountered. His “Paternal Mentoring” approach came from his ability to act as a spiritual and surrogate father to his boys. St. John Bosco was able to both absorb the wounds and pains of his boys while, simultaneously, enforcing a strict discipline, because he had individualized expectations of each child based on their unique character. Indeed, for St. John Bosco the starting point was to gain a deep knowledge of the boy’s character, and to perceive the individual dignity and essence of that character with a spiritual love and insight. 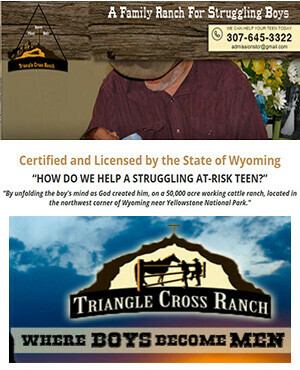 Using St. John Bosco as an example of how we should work with today’s youth, Triangle Cross Ranch’s staff are able to reach students effectively while living, working, praying, and dealing with life’s obstacles on a cattle ranch. By participating in the daily activities with the boys, our Mentors develop a very rich and paternal relationship with them that makes the boys feel more comfortable and able to discuss their emotional problems. We also find that in the relationships our Mentors build with them the boys are more responsive to discipline and behavioral modification methods because they hold our Mentors in esteem.